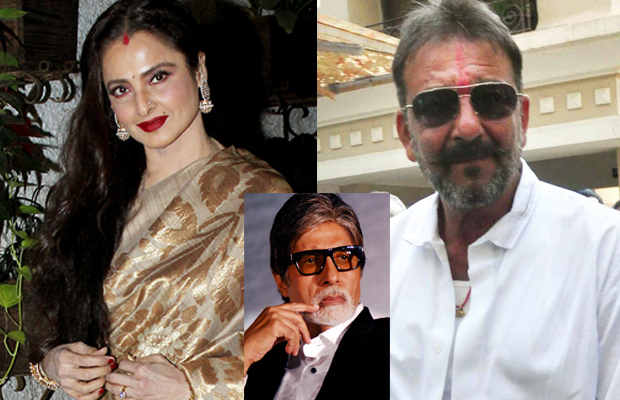 Home BOLLYWOOD Not Amitabh Bachchan, Rekha Secretly Married Sanjay Dutt? Here’s The REAL Truth! Not Amitabh Bachchan, Rekha Secretly Married Sanjay Dutt? Here’s The REAL Truth! It’s been buzzing that Bollywood veteran Rekha is married to Sanjay Dutt and has been applying sindoor in his name. Rekha has been making headlines today, but for the wrong reason. The actresses private life has always been the hot topic of conversation. One of the questions that has come across in everyone’s mind is about the red sindoor that Rekha always wears on her head. Rekha was married to Mukesh Agrawal, who died back in the year 1991. But till date she’s seen wearing sindoor at all events. It was speculated that Rekha wears the sindoor in the name of Amitabh Bachchan. Now the rumours of Rekha being secretly married to Sanjay Dutt have started doing the rounds on social media and have gone viral. But as per reports, Yasser Usman’s book titled Rekha The Untold Story reveals that Rekha is apparently secretly married to Sanjay Dutt. And she wears the sindoor for Dutt and not Big B. The reports further claim that while shooting for the 1984 film Zameen Aasmaan, Rekha and Sanjay Dutt came quite close. So much so that they got married secretly and till date nobody knew about their secret marriage. If you read the book carefully, Usman’s book actually has these lines which has been wrongly interpreted. During these years a succession of names came to be associated with her: Shailendra Singh, Kamal Haasan, producer Rajeev Kumar, even Sanjay Dutt. One fine day, out of the blue, came the news of her marriage with Sanjay Dutt. An unfair rumour, because she was sincerely helping him recover from a rough patch. And the release of their film, Zameen Aasman, gained from the rumour. Sanjay Dutt had to actually issue a formal denial of their rumoured marriage. Next articleRhea Kapoor’s Birthday: Sonam Kapoor, Harshvardhan Kapoor And Anil Kapoor Have The CUTEST Gift For Her!